Book Club Edition, first printing and true first edition. The first appearance for this title in any form issued by Science Fiction Book Club with first printing code H19 on page 182 and code 1811 on rear jacket flap. Signed by contributor Michael Moorcock on the Contents page at his story "The Lands Beyond the World" an Elric story. Not a remainder or ex-library copy. Page block is clean, square and without previous owner's marks. Jacket panel is lightly sunned, with faint crinkling at top and bottom corners of spine panel, else a fine copy in near fine jacket Otherwise the jacket is clean without tear-outs, nicks or stains. A wonderful copy. 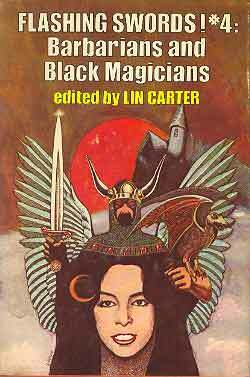 Original anthology featuring stories by the following authors: Jack Vance, Poul Anderson, John Jakes, Katherine Kurtz and Michael Moorcock. Interior illustrations by Rick Bryant. Introduction with story notes by Lin Carter.